Online video has been gaining momentum with marketers for years and now these online outlets are finally getting a major share of advertising dollars. Over the last year, many major brands have shifted money toward digital media channels. This trend is likely to continue now that online outlets are planning to increase their programming. The Wall Street Journal took a closer look at the media drama to show why marketers are moving their money online. Advertisers have been slowly shifting their ad dollars toward online outlets for a while, but this is the first time that digital media is getting a significant share of ad budgets. And today’s better online content and more accurate metrics have made advertisers much more comfortable redirecting dollars into online video advertising. Digital media commanded one-quarter of total U.S. ad dollars in 2013 and that percentage is poised to rise and take a bite out of other broadcasting budgets. By 2018, eMarketer predicts a total shake-up with digital media claiming 36.4% of ad dollars. Many media agencies have already shifted hundreds-of-millions of client dollars into online outlets over the past year. These agencies are simply following the audiences, who tend to spend more of their time online today. The statistics tell the story with comScore reporting a 14% year-over-year increase in daily online video audiences in the month of March. Ad executives are well aware that younger consumers are spending more time online. According to Nielsen, the coveted 18-to-34 age group accounts for 30% of online video audiences. As a result, international snack-maker Mondelēz plans to shift 10% of its global ad spending into online video by the end of 2014. This follows the company’s double-digit percentage shift toward online video in the U.S. last year. And MasterCard moved a single-digit percentage of its total U.S. TV budget to online video channels last year. The company is planning to increase that percentage this year now that online outlets enable more precise targeting. Online outlets see the enormous profit potential and are working harder than ever to attract advertisers, even going so far as hosting their own version of “upfronts,” called the NewFronts. But TV is fighting to maintain its reign. Networks NBC and Fox are debuting thrilling new dramas and female-focused comedies, while pushing their proven performers. There’s no denying that TV can draw major mass audiences and the networks will use that appeal to their advantage. While TV networks and online outlets fight for the bigger share of advertising budgets, viewers will be the ultimate winners because it will drive the development of much better programming to keep viewers watching and wanting more. 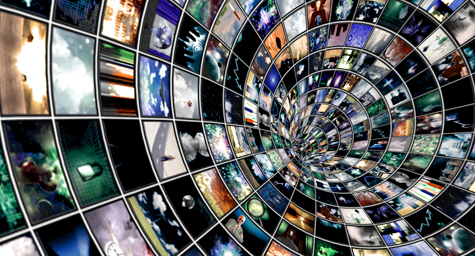 Discover how online video advertising can impact your media-buying strategy. Contact MDG Advertising today at 561-338-7797 or visit mdgadvertising.com.